I like to make good things. I settled on a spin on this recipe, from My Gourmet Connection, because, um, bananas and cinnamon, really. How are you ever going to go wrong with magic like that in a cake? As it turns out, I was tragically right. I say tragically because I only got to eat one. The rest evaporated out of the kitchen and into the hands of family and friends. Delicious, delicious, subtly-spiked, gorgeously spicy, fluffy, creamy bites of paradise. 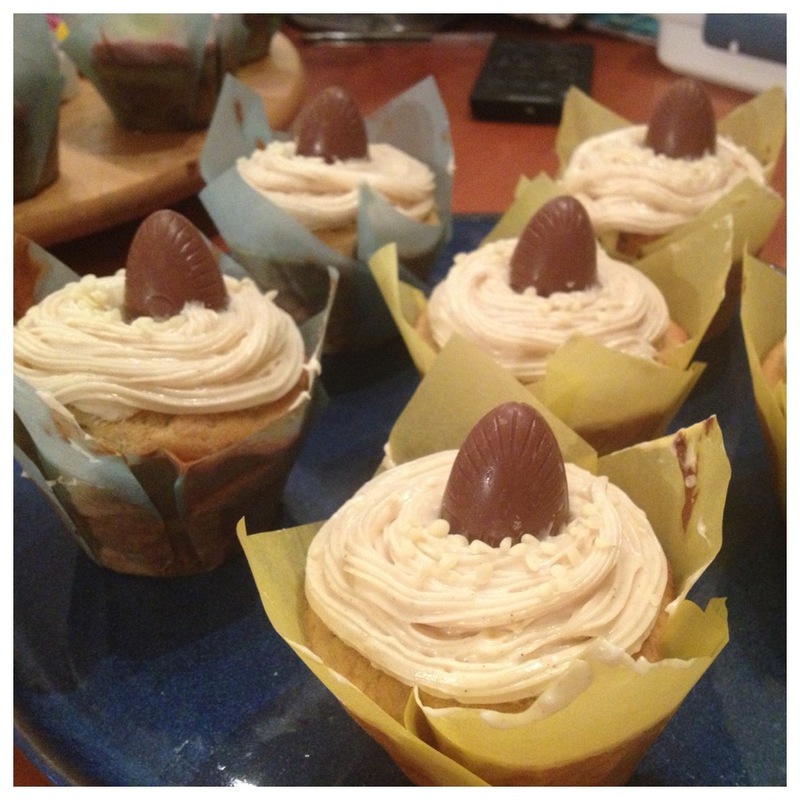 I’m fighting the urge to make these again tomorrow for the sheer sake of getting that taste back. That’s how good they are. 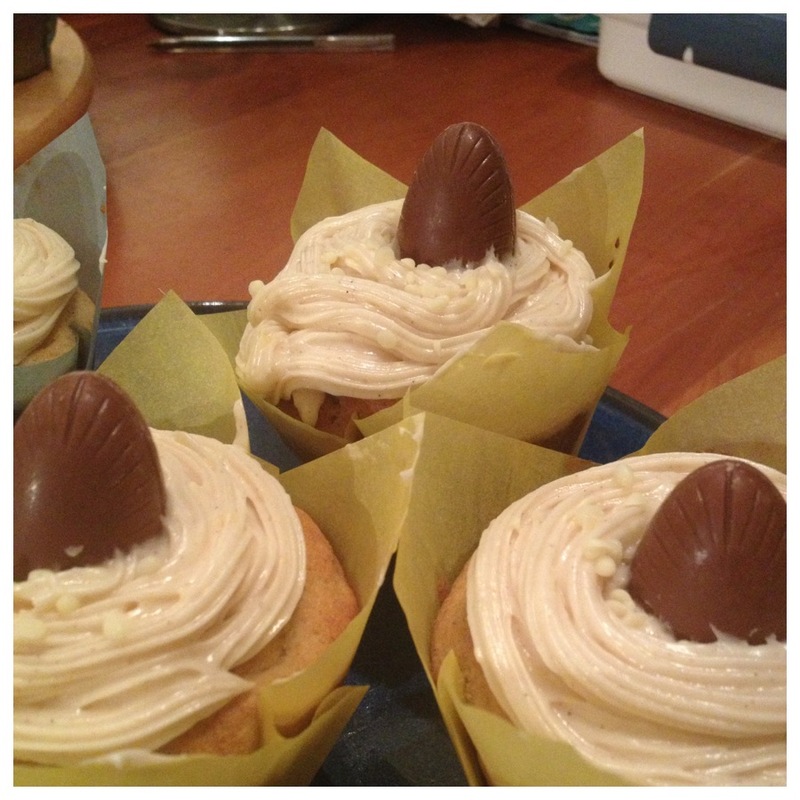 I topped these off using Noisette filled Milka chocolate eggs, which means these cupcakes could technically be a comment on both Easter and Paddy’s day. Why not? It’s also how they got their name. Putting chocolate on such heavenly things – particularly milka chocolate – was not a difficult decision! You could use whatever decorations you want – sliced bananas would probably be more appropriate! 1. Preheat that oven! 190 C if you’re fan-free, 170 if you’re fan-benefited. Line a twelve cup muffin tray. Put on this music, because I just couldn’t recommend it more right now. 2. Use a spoon and your hand to combine evenly the flour, baking powder, soda and salt in a large mixing bowl. In a separate bowl, beat the butter and sugar together until creamy, then add the eggs and beat until the mix is looking light and even. 3. 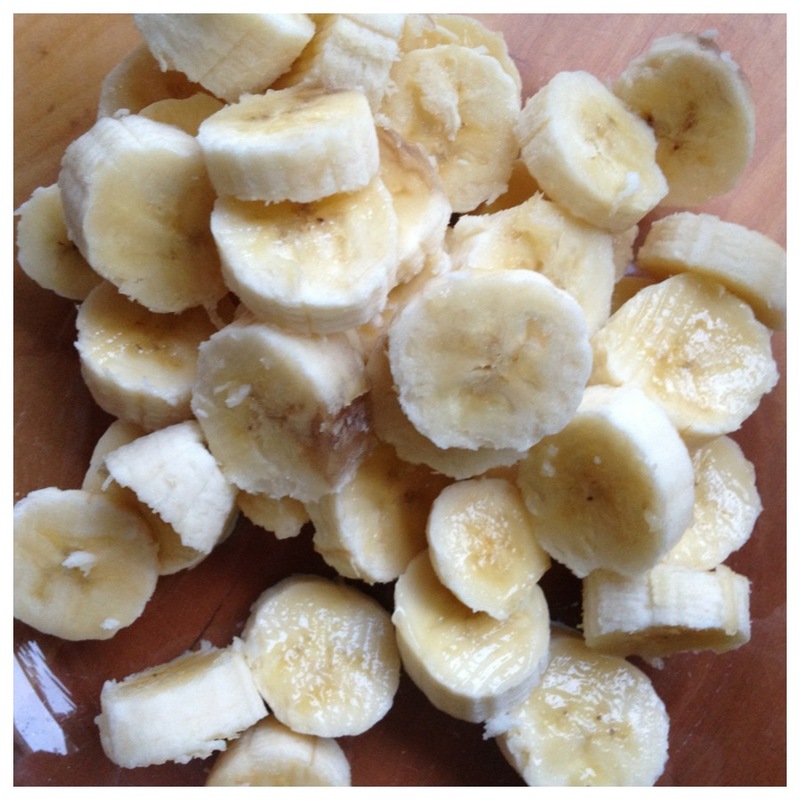 Add the bananas to your wet mix, and beat through until smooth. Add vanilla essence, rum and hazelnut milk in turn, beating to even consistency each time. Add the flour mixture, part by part, to your wet mixture, beating to even consistency at each turn. Noticed you haven’t had to use an electric mixer once so far? Yup! Only need it for the frosting. Yay! 4. I recommend pouring the batter from a measuring jug into your liners to get things even and mess free. Bake for 18 to 20 minutes, or until the tops of the cupcakes spring back readily when touched (mine took twenty minutes on the dot). Now here’s the funny trick – apparently you let these continue to sit in the hot tins once out of the oven. I let mine stay there about three minutes (despite the recommended ten) as I am very paranoid about dry, mealy batter – then stuck ’em on wire racks to cool. 5. To make your gorgeous amazing incredible spicy rum frosting, put the cream cheese, butter, cinnamon, vanilla extract, rum and confectioners’ sugar in a large mixing bowl. Get out the electric mixer and go at the lot til everything is smooth and consistent and thick. 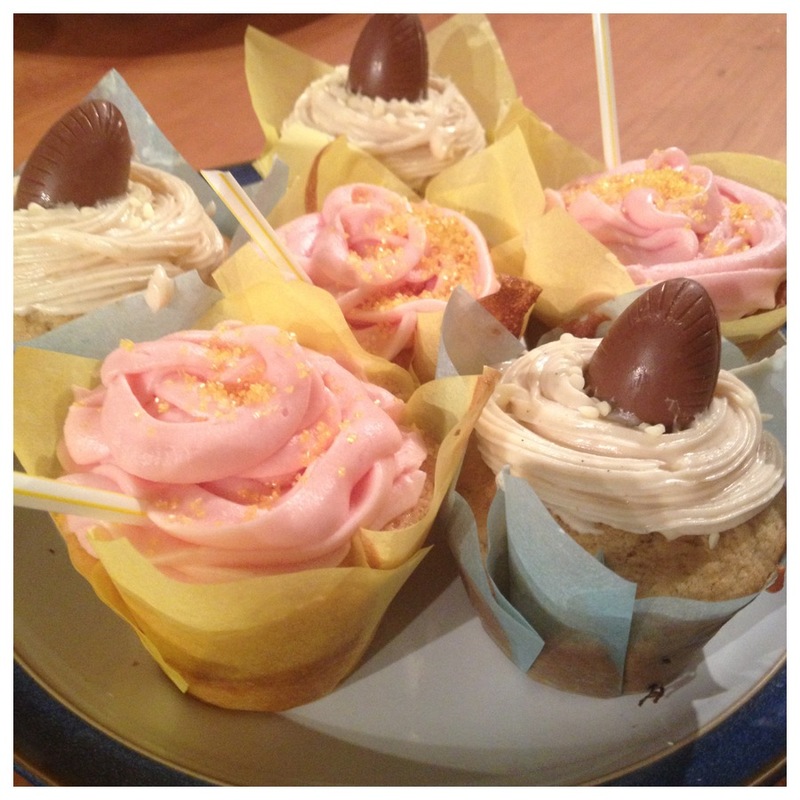 Use to ice your completely cool cupcakes – give them an hour or so before you try. I used a circle nozzle and a piping bag because I’m trying to get better at that stuff right now, but you won’t go wrong with a spoon and a scrape-knife! These would go really well with an Angel’s Rinse. Seriously. Seriously. The cinnamon and the rum. So good. Argh! Click to follow this blog and receive notifications of new glories and delightful things!